KingJime Automatic Pressure Equipment Co., Ltd.
1. 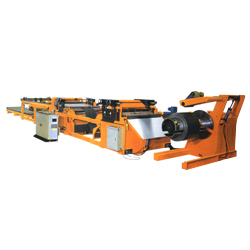 Cut to length lines can do uncoiling, straightening, gauging, cross-cutting to length and stacking work. It mainly includes uncoiler, straightener, gauge, shearer, conveyor, stacker, hydraulic system, pneumatic system and electrical system, etc., the line can make sure of accurate feeding and shearing. It can be widely used in cold or hot rolling carbon steel, tinplate, stainless steel and all the other kinds of metal materials with surface coating. 2. Cut to length line is controlled by PLC system. It has PLC controlled single shaft feeder, The information of length, shearing numbers and speed can be input to the PLC systems. When the need shearing number is reached the line can stop automatically. The line speed can be adjusted, It has a gauge with high precision, and whole line can work automatically and operate easily, smooth sheet can be made. (9) Pneumatic discharge and stacker device. (12) Electrical system with computer PLC program control. 1. Thickness: mm: 0.3-2, 0.5-3. 2. Width mm: 1500, 2000. 3. Load weight ton 15, 30. 4. Straighten precision Mm/m2 1.2. 5. Gauge precision mm: +-0.5. 6. Line speed: m/min: 40-60. 7. Power kw -65, -95.